Wednesday finishing and nearly so! Life and writing have not connected in a long time. For many reasons but the best one is how many projects I have been successfully getting out of inertia. This post is about giving the finished ones a warm Wednesday welcome! At the top of last month, I had a lovely time over lunch with my friend, Sasha. Her first Skein-a-Day April Sheepspot event was here on my needles. 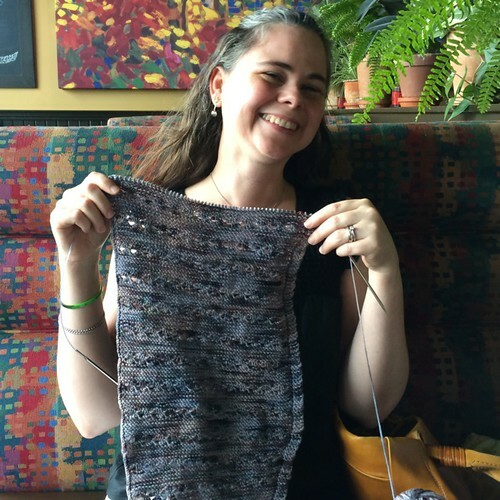 The short dye repeats worked beautifully for Susan Santos’ Magical Side to Side Scarf design. There was no flashing either in the fancy stitch bands or as the scarf sections changed dimension. 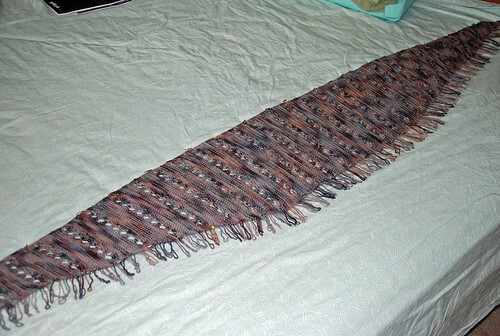 Blocking really helped to shape the scarf, and organise the drop-stitch fringe. It is 69″ x 9″ in this yarn. I knit with 3.5mm needles. 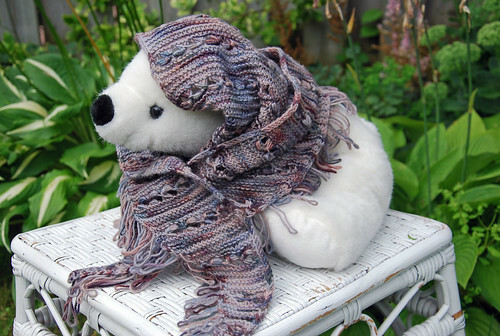 This one is going to a good friend, so I let the stuffed polar bear model it for you. Love the yarn tones for this pattern! The pattern stitch was simple to work, and easy to remember. This project took me longer because I ran out of yarn, frogged and needed to come back to reknit the end section. 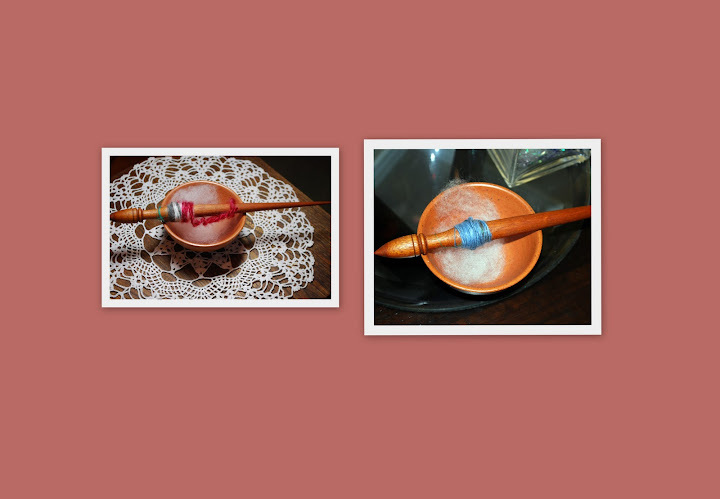 A spindle deserves organic Polwarth wool! Last month, Sasha introduced her dyed organic wool top. It was such a nice surprise, and I wasted no time in starting a spin. This is my Tabachek cedar compact deluxe spindle (22.5g). Couldn’t be happier about this material + tool combination! It’s a real sock début! I gave these zero air time but they were started at the end of February this year. 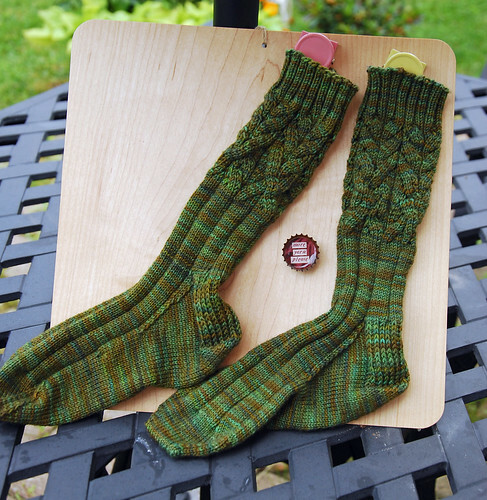 The yarn is gorgeous String Theory Caper Sock in vert. 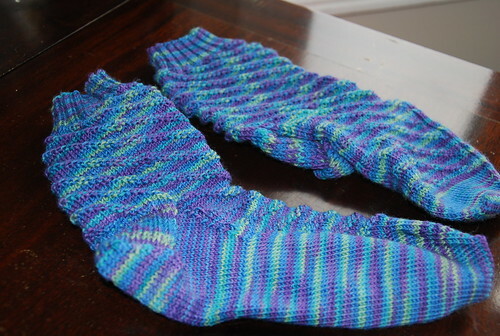 They are knit with 2.5 mm needles and using the Cadence Socks (part) pattern. It’s a good pattern – I just needed to go mindless this winter, and changed to the 6 x 2 ribbing. This next start date goes back an entire year to February 2013. The disgraceful pace is simply because I pushed through with 2.0 mm needles to get gauge with my Araucania yarn of choice. 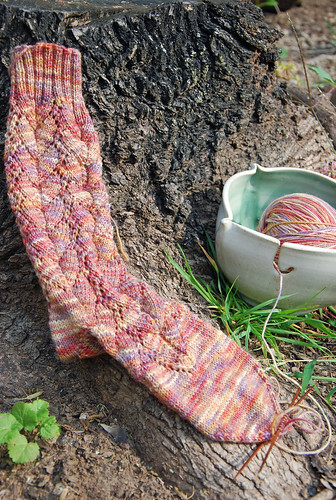 The pattern is Hummingbird by Sandi Rosner, and I am hoping to make a second sock soon. Wanting a pair of socks in this colour has not exactly left the building. The first post for these RPM socks was last November, shortly before I finished the first sock. Sometimes work just falls through the cracks. There is nothing like a tough winter to precipitate the gaps as it were. 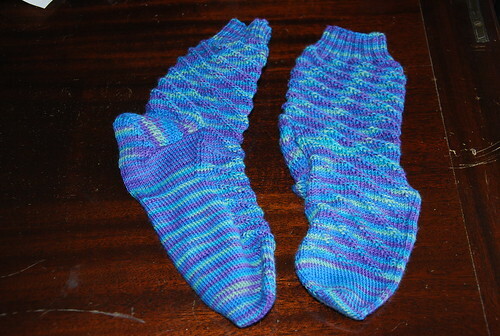 Finishing these helped me get my sock knitting mojo back in order. The old pairs are wearing out, and I promised N that I will work on a new pair of stranded socks for him! This year has brought more babies to knit for than I have been able to share. The youngest cousin (that we know of) is due in January. WIP clearance has let me cast-on for this now (yay!). 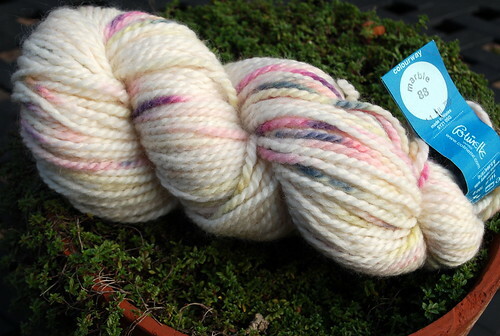 It’s been ages since I have seen any Colinette yarns locally but this is luxury for me. 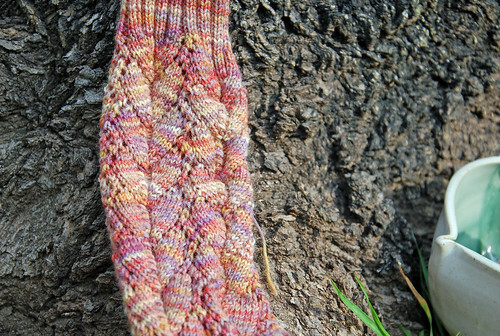 I also have accent yarn from another Iona colourway, and loved the first night’s work this week. 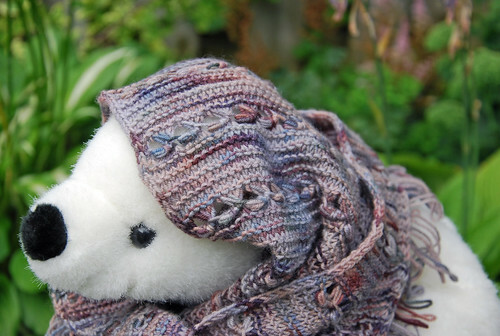 Saving the weaving news for a later post, and wishing everyone well! 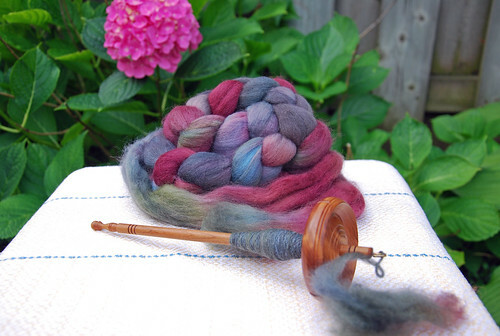 Categories: Finished & in the wide world, In the Pipeline, Spinning, Stash in; Stash out | Tags: Baby gift, Knitty, Merino wool, Polwarth wool, Scarf, Shawl, Sock, suspended spindle | Permalink.